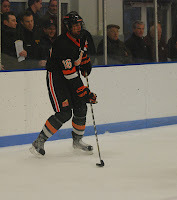 2013 recruit Robbie Baillargeon is blogging daily for New England Hockey Journal from the NHL 2012 Combine, where he is one of 105 top prospects meeting with scouts and other NHL team personnel. Baillargeon, who scored 48 points for Indiana this season and was ranked 50th in Central Scouting’s final ranking of North American skaters, is rooming in Toronto with 2012 recruit Sam Kurker, who was ranked #36. 2014 recruit Jack Eichel spoke with Chelmsford Sports News about his decision to play for BU and his approach to the game. The Pipeline Show reports that USHL top scorer and MVP Kevin Roy, currently a Brown University recruit, is "exploring getting out of his commitment and possibly playing for Boston University or Boston College if possible." We'll continue to follow this story. ESPN Dallas talked with Alex Chiasson about his senior year at BU and his first few games as a professional. Former Terrier Chris Bourque, who led the AHL in scoring this past season with 93 points, was traded by Washington to his hometown team, the Bruins, the club his father, Raymond Bourque starred for. Bourque has played 33 NHL games with Pittsburgh and Washington. Former Terrier captain and current New York Rangers Associate Head Coach Mike Sullivan is reportedly to be a leading candidate for the vacant coaching job in Calgary. Sullivan, who played for the Flames for four of his 12 NHL season, also was head coach of the Bruins in 2003-04 and 2005-06. U.S. Hockey Report has posted that BU and 2012 recruit Robert Polesello have “parted ways.” Polesello recently completed a season with the USHL Indiana Ice, producing a 15-16-31 scoring line in 58 regular season games. The break apparently results from an off-ice incident involving Polesello late in the season. BU suggested that Polesello defer a year to 2013, but the 5-7 forward wants to play college hockey this coming season and has decommitted. Given BU’s recent history with off-ice violations, the decision by the coaching staff is not unexpected. Sam Kurker, the All-Scholastic right wing from St. John’s Prep (32-32-64) and MVP of the MSCHA All-Star Game, moves up to join the 2012 class. Earlier today he tweeted, “It's official! Heading to BU next year. Cannot wait to get started.” On Monday, Kurker will be in Toronto for the NHL Combine along with 104 other top prospects from North America and Europe. 2013 recruit Robbie Baillargeon also will attend the combine, which continues through June 2. Combine invitee list. In the NHL Central Scouting final rankings, Kurker was #36 and Baillargeon was #50. ► Correction: On May 18, we posted that the BU-North Dakota series in Grand Forks would be on Nov. 11, 12. The correct dates are Nov. 2 and 3. We also stated that the out-of-conference schedule is complete. Since the Hall of Fame game vs. Denver is exempted from the 34-game limit, there is one more OOC game to be scheduled. ►Two BU recruits were selected in Tuesday’s USHL entry draft. 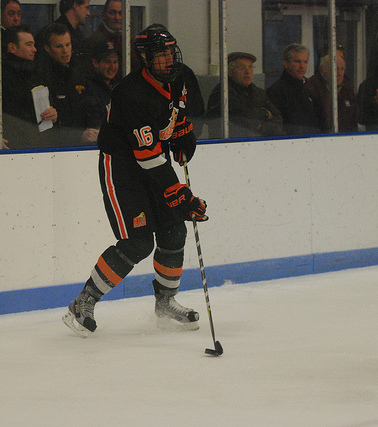 2013 recruit Doyle Somerby, a 6-5 d-man from Kimball Union, was picked by Muskegon. The other was Kurker—prior to the decision that he’d join BU this year. He was picked by Indiana. Two other members of the 2013 recruit class have draft rights held by USHL teams. Jarrid Privitera (Dubuque) and Kevin Duane (Waterloo) each skated a few games for their respective USHL clubs last season during breaks in their prep schedules. 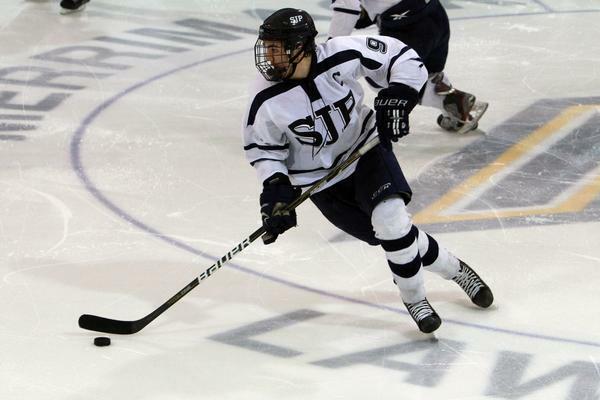 The Boston Herald reports that 2013 recruit Brendan Collier who led Malden Catholic to a second straight Super 8 title, will be skate for the EJHL Valley Junior Warriors next winter. The left wing from Charlestown scored 27 goals and added 37 assists in 22 games, earning All-Scholastic and ESPN Boston “Mr. Hockey” honors. It’s still nearly five months until the next college hockey begins and BU’s full schedule is not expected to be announced for at least a few more weeks. But thanks to a Web site logging pieces of schedules as they become available, we know about the Terriers first few games and the full out-of-conference schedule. Like last season, the Terriers get it started against Providence, hosting the Friars on Oct. 7. A week later they travel to Durham for the first of three first-semester games against New Hampshire. BU is at home against the Wildcats on Nov. 18, away on Dec. 6. The out of conference schedule begins Nov. 11 and 12 in Grand Forks with a pair of games against North Dakota. Then, on the Saturday after Thanksgiving, receives a visit from St. Lawrence. BU last played these two opponents during the 2008-09 national championship season. First semester concludes in Denver as BU takes on the Pioneers in College Hockey’s annual Hall of Fame game on December 29. An early January match up with RPI in Boston and the annual Beanpot Tournament (Northeastern in the first round) complete the out-of-conference games. ►Last month we reported on activities of Athletes4Autism, founded by senior forward Kevin Gilroy. Now, the Boston Hockey Blog has posted a feature story and video looking at how the organization was launched and also Gilroy’s on-ice work with a 13 year old hockey playing girl who has Asperger’s Syndrome. ►A pair of blueliners, Ryan Ruikka of the men’s team and Kasey Boucher of the women’s team, were among the 10 BU athletes honored with a Scarlet Key in recognition of their service to the BU community. ►We also recently noted the Phoenix d-man Adrian Aucoin is the sole remaining ex-Terrier playing for the Stanley Cup. However, five others who are in off-ice positions, remain in the hunt for hockey’s Holy Grail. Former BU All-American goalie Jack Ferreira is special assistant to the Los Angeles Kings’ general manager, while Steve Greeley and Mark Mullen are on the Kings’ scouting staff. Mike Sullivan, a former Bruins head coach, is assistant to the Rangers’ John Tortorella, while Scott Lachance, a first round draft choice in 1991, is a New Jersey Devils’ scout. ►In the ECHL Kelly Cup finals, Pete MacArthur has a goal and an assist in three games, but the Wranglers trail two games to one to Florida. Game four is set for next Tuesday and game five on Wednesday, both in Las Vegas. Mile High Sports Reports that four-year Terrier goalie Kieran Millan has signed an entry level AHL contract with the Colorado Avalanche. 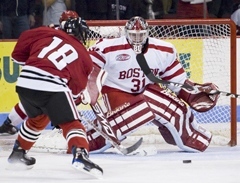 The two-time BU MVP award winner, who also was national rookie of the year as a freshman, backstopping BU to the NCAA title for 2008-09, was the Avs fifth round draft choice in 2009. He’ll compete for the starting job at Lake Erie next season. Hockey Buzz analyzes the performance of Avs Coach and former Terrier standout Joe Sacco over the past three seasons with management constantly tinkering with the club’s roster. The Boston Globe’s Fluto Shinzawa, looking at the role of strength and conditioning coaches in preparing potential draft choices for the NHL combine, talked with BU’s Mike Boyle, who helped Adam Clendening emerge as a standout in last year’s combine. With Notre Dame set to join Hockey East as its 11th member in 2013-2014, the conference has honed in on Connecticut as as likely 12th member in an effort “to ease scheduling problems.” If UConn, already a member of Women’s Hockey East, comes aboard, it would be for the 2014-15 season with some of its games to be played in Hartford’s XL Center. With the Coyotes’ elimination of Nashville last night, only one former Terrier, Adrian Aucoin, remains in the hunt for the Stanley Cup. The veteran blueliner, now in his 16th NHL season, has never before reached the conference finals. The season ends for Colin Wilson, who scored the Predators’ only goal in their 2-1 loss, and Brandon Yip. The former BU teammates skated on the same line in several recent games. Sunday night, despite Kevin Shattenkirk’s first ever playoff goal, the Blues were eliminated by Los Angeles in a 4-game sweep. Former UMass goalie Jonathan Quick, continuing his standout play for the Kings, stopped shots in a 3-1 win. The season continues, however, for ex-Terriers Pete MacArthur and Ryan Weston of ECHL Las Vegas. The Wranglers will face Florida in the Kelly Cup final after dispatching Alaska in five games. MacArthur scored the game-winner in the fourth game, which Las Vegas won, 3-2. CHN’s Adam Wodon reports that the NCAA Ice Hockey Rules committee will commend replacing full face shields with three-quarter shields. BU Coach Jack Parker, a longtime advocate of this change, made a strong presentation to the committee as did Notre Dame’s Jeff Jackson and the NHL’s head injury specialist. Other rules changes considered. BU assistant coach Buddy Powers’ daughter, Caroline, is making her own headlines as one of the nation’s top collegiate golfers. A junior at Michigan State, she finished sixth last year in the NCAA finals, best performance ever for a Spartan, and has her sights set on a pro golf career. 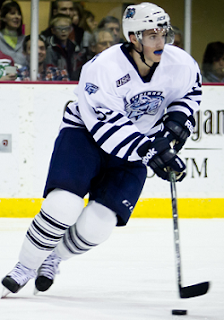 2013 recruit Brendan Collier was among the top scorers at this past weekend’s Pro-Am Hockey Pre-Draft Showcase, with a 3-5-8 line in three preliminary round games and 1-4-5 in two playoff games. Indiana’s Robbie Baillargeon, also a 2013 recruit, was the second leading playoff scorer for the Ice who lost to Green Bay in the USHL playoff semifinals. Baillargeon, who will attend the NHL Draft Combine in Toronto later this month, had a 4-2-6 line in six post-season games. ►The Elliott Dribben Lobby at the Case Athletic Center (see THFB 4/27/12) was officially dedicated this past Saturday. BU Hockey Hall of Famer Tim Regan was among the speakers at the heavily attended event honoring "The Mayor of Terrier Nation." MacLeod played for Kimball Union Academy last season, helping to anchor the Wildcats’ blueline with 2013 recruit Doyle Somerby. He assisted on two goals as Kimball Union defeated Holderness 3-2 in overtime to capture the NEPSAC Piatelli/Simmons Division tournament championship. ►USHR reports that approximately 20 NCAA schools approached Eichel, but that BU and BC were his finalists. The 6’1, 175 right-shot center will be a junior in high school this season, arriving on Comm. Ave. in 2014 as a 17 year old with close friend MacLeod. His NHL draft year is 2015. He was USHR’s pick as “the best player in camp” at last summer’s Select 15 Festival in Rochester, NY, despite a broken toe. He earned the same ranking two months ago in the spring Beantown Classic Pre-Draft Division. “In my opinion, of all the players who have been through the Junior Bruins organization, he has the potential to be the best of all. He does everything so well. He shoots it better than everyone. He thinks it better than everyone. He’s an effortless skater who seems to get up and down the ice in three strides. He’s tall, lanky, and plays long – he’s just so good at protecting the puck with players on him. He holds it away from defenders so well, and always with his feet moving. "I really like the coaches over there. I really like coach (Jack) Parker and I really like both assistant coaches, coach (Mike) Bavis and coach (Buddy) Powers. The facilities over at BU are incredible." 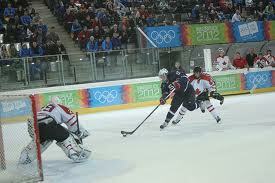 ► Eichel was named to the Team USA roster that played in the World Youth Olympics (photo below) in Innsbruck this past January. Eichel co-led the team in scoring. ► He led the Boston Junior Bruins Empire League team to the 2011 Tier III Junior B National Championship in Marlborough, Mass. Eichel scored a team-leading 9 goals and 6 assists in six games, including a goal and an assist in the 3-2 OT championship game victory against the New Hampshire Junior Monarchs. Ohio Website Vindy.com, wrapping up the Youngstown Phantoms season offered kudos to 2012 recruit Matt O’Connor, the 6-5 goalie who will compete for the BU goaltending job. No one excelled as much as O’Connor, the Toronto native who will play for Boston University this fall. Pro-Am Hockey’s annual Pre-draft Showcase begins this Friday at sites in Foxboro, Canton and Walpole with four future Terriers rostered. 2012 recruit Brendan Collier skates for the East Coast Kings, while 2012 recruits Danny O’Regan and Marc Hetnik, Jr., and 2013 recruit Sam Kurker will play for the East Coast Militia. Chris Connolly, BU captain for the past two seasons, has signed a two-year contract to play for Tappara of the SM-Liiga in FinlandThe Duluth, MN, native scored 129 points in his four seasons as a Terrier. . Last month, his brother Jack, who won the Hobey Baker Award this season, signed on with Färjestad BK of the Swedish Elite League. Looking ahead to the Anaheim Ducks’ next season, the Orange Country Register profiled Nick Bonino. Former Terrier Pete MacArthur scored a goal in the Las Vegas Wranglers’ 3-2 win against Alaska in the ECHL Western Conference finals. MacArthur, who scored 48 points for Las Vegas in the regular season and had a brief stint with AHL Lake Erie, playing for former BU Associate Head Coach David Quinn, has a 3-4-7 line in nine playoff games. Joe Robillard, former Terrier goalie and coach at Methuen High School, will be inducted into the Massachusetts Hockey Coaches Hall of Fame this Sunday. A member of BU’s 1972 national championship team, Robillard was the head coach at Methuen for 19 seasons, from 1984-1985 to 2002-2003. ► The Beanpot Forum reports on the just concluded NCAA hockey coaches gathering in Naples, Florida, where, among other topics, the use of half-shields was on the agenda.